REVIVAL OF DOKURORIDER - Yu-Gi-Oh! 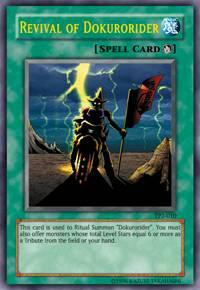 This card is used to Ritual Summon “Dokurorider”. You must also offer monsters whose total Level Stars equal 6 or more from the field or your hand as a Tribute.